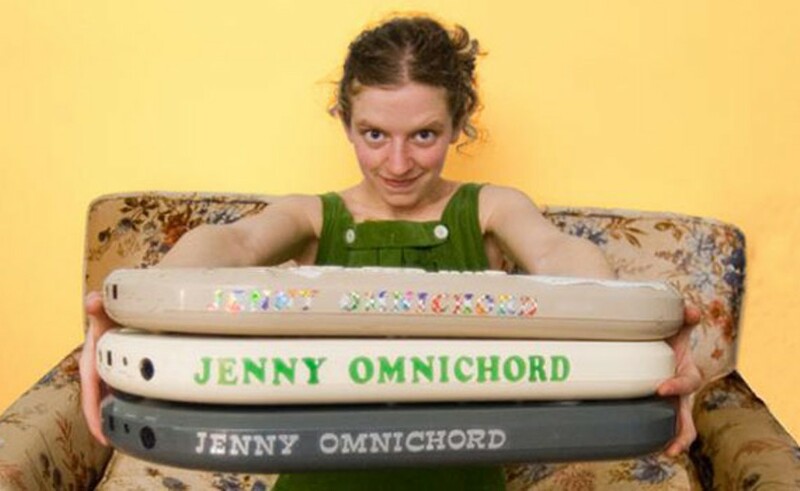 Omnichord, AKA Jenny Mitchell, on touring with Otis, her two-year-old muse. The 2008 In the Dead of Winter was a memorable one for Jenny Mitchell, AKA Jenny Omnichord. "I thought I'd broken my foot, and people kept giving me whiskey for it." So Mitchell went to the hospital where she got a pregnancy test prior to x-rays, and "I found out I was pregnant." Two years later, she's heading back to play the festival again, her son Otis in tow. It's far from her first tour with the toddler. "I tour more and play more shows than ever before," she says. "I guess I'm making an effort to prove I can still do it." Nobody who caught her here or at Sappyfest in summer 2008 while eight months pregnant will doubt her stamina; at 25, Mitchell has been on the Canadian indie scene for nearly a decade since her band The Barmitzvah Brothers (on hiatus) first attracted attention. Right now, she's busy working on a new album (tentatively named All Our Little Bones), slated for a spring release. The album will be the first recording released on a new label she's starting with some friends, including Wax Mannequin and Matthias Kom (The Burning Hell). Label Fantastic! will exist as more of a collective, with different responsibilities for everyone and an "artistic angle" to releases. They're trying to create a new model for labels and distribution, rather than it being "in response to being unhappy with the labels we're on." Mitchell's new record features more autobiographical songs than her previous releases, which had a higher quota of "weird stuff." She wrote many of them "anticipating what was going to change when I was pregnant---psychological stuff," she says. "The first baby is such a mystery, but he's so above and beyond awesome. The lead-up to a baby is a lot harder than after the baby comes. You have all these months that are just you and this theoretical baby." On touring with an infant, Mitchell says it was "really easy" when Otis was first born. "It was hard in the summer because he was getting to the stage where he wanted to move around...it's getting harder, in the next year or so I'm going to have to start leaving him when I go on tour." "It's hard not to feel guilty that I'm just subjecting him to what I want to do," she says. Dealing with everyone's opinions on parenting gets stressful too---her son is on her schedule, accompanies her to shows and usually goes to sleep around midnight, but not everyone knows this. "He starts crying, and he's crying about something totally unrelated, but people are saying, 'Who is this mom? This kid should be in bed,'" she says.